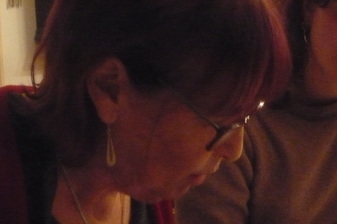 Sheila Robin, who founded Red and Green Choir in 1998. She was a great friend and comrade who will be so missed. In memory of Sheila and her forceful intelligence, lively humour and high principles. A ballsy woman! JoanI met Sheila through mutual friends when my daughter was under two over 24 years ago. We became friends first through the girls and then through politics and interests that we shared, reading, singing, travelling and eating! We four, when the girls were young went to Street Music Festival together as Sheila was then in Raised Voices. She and Anna introduced Lily and me to the political choir's world. After one trip Sheila decided to start her own choir and the then Velvet Fist choir leader, Graham,, agreed to lead this new little choir for a few months to get us off the ground. We started in Sheila's front room in March 1998 with about ten of us. Sheila named the choir Red and Green temporarily until we could find a 'better' name. We never did. Sheila and I became much closer in the last five or six years. As our daughters grew and left home, Sheila suggested we do an annual trip together, the four of us. This gave the opposite mother a chance to visit with the other daughter and deepened all four of our relationships. She also came on many Red and Green events and trips including Aberystwyth in July 2014. Sheila had an unusual highly intelligent mind and always surprised me. She had a different take on the world that was original and enlightening. As well as being totally committed to creating a just world, she was also a deeply loving and caring person to her family , her beloved daughter and to me. The world feels a much less interesting and warm place without her. She is deeply missed. In memory of Sheila and her forceful intelligence, lively humour and high principles. A ballsy woman! I was really sorry to hear about Sheila’s death. She had great courage and staunch commitment, and I am personally enormously grateful to her for introducing me to the world of socialist choirs. I was really sorry to hear about Sheila’s death. Unable to attend the funeral as I was abroad, but if there is any memorial event planned I would be glad to hear of it. She had great courage and staunch commitment, and I am personally enormously grateful to her for introducing me to the world of socialist choirs.